Gimme 15 minutes I tell you something important, gimme a couple hours I'll change your life! Mel retired from IBM as a systems & procedures analyst with worldwide quality assurance field quality assurance responsibility for parts manufactured on 4 continents. Before retiring, Mel also held positions in management and quality engineering. Post retirement activities include consulting on the LEGENDS Race Car program of 600 Racing with Humpy Wheeler and the Allison family, was a member of a productivity improvement team for the Star Bank of Cincinnati and has written many start-up business plans and grants since retiring. Mel also served 5 years as an active S.C.O.R.E. counselor in Charlotte. 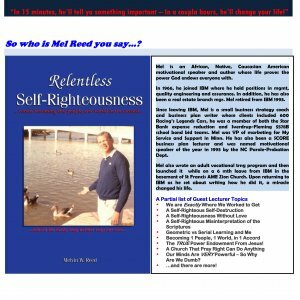 Lastly, he was ordained to preach the Gospel of Jesus and he wrote a book titled Relentless Self Righteousness. Unique career highlights include being on the D.O.J. Expert witness list involving the anti-trust suit against IBM while managing the on-site technical training program and document pre/post structuring operations, he also spent 10 months in Thule Greenland (before global warming). Unique community activity includes writing and obtaining federal funding for an adult vocational training program in Port Chester, NY, and Gastonia, NC and being named volunteer of the year as a motivational speaker in the North Carolina correctional system (Southeast Region). Mel does not have a High School diploma. Mel says he owes it all to a miraculous event that changed his life by deepening his personal faith in God.